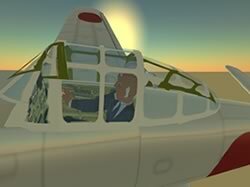 Anywhere but Second Life the sight of a Japanese Zero zipping around the skies on Memorial Day weekend might just start a riot. Not here though. In this surreal world a vintage fighter plane from the wrong side of the tracks isn’t likely to raise an eyebrow. I had just taken possession of my new aircraft and was jetting around Scaroth on a test flight. The plane is light, surprisingly agile, and a just a little too responsive. One moment I’m climbing into the sky with nothing but clouds in sight, the next moment I’m zooming straight for the ocean. Funny thing about those Zeros — once they go into a nosedive there’s no pulling back. It’s like they were engineered to crash or something. Which is exactly what happened next. After narrowly missing a club called the TerrorDome I found myself completely submerged at the bottom of a lagoon. Since then I’ve crashed my Zero on numerous occasions, and I’ve finally taken to telling bystanders that I’m one of those WW II re-enactors. So far no one has bothered to ask any questions. As I wander around the grid I’m frequently surprised by how foreign Second Life really is — and I don’t mean foreign strange (although it usually is that too), I mean foreign international. I’m not just saying this from an American perspective, because the mix of residents in Second Life is so diverse that it must feel foreign regardless of your nationality. According to recent statistics only 19% of active Second Life users are from North America. The largest national groups were Germans and Americans at 16% each. Clearly, no nationality comes close to being a majority in the metaverse. Second Life is probably as close as you can get to traveling abroad without having to clear customs first. As a result of this diversity, the things we Americans care about don’t always mean a much to the majority of residents leading their second lives. My Brazilian and Dutch neighbors in Scaroth couldn’t care less about Memorial Day and I’m sure they’ll feel the same way come July 4th. It’s a different world here and it shows in any number of ways, not the least of which is the manner in which various nationalities conduct their virtual political activities. To date, the US presidential campaigns have been incredibly sincere and surprisingly conservative. What little drama the campaign has witnessed has involved some relatively isolated griefing, disappearing campaign headquarters, and an almost obsessive need to be taken seriously by the mainstream media (and the mainstream party machinery for that matter). The French have waged a war against the fascist group Front National. The battle lasted for days and ultimately lead to the notorious “pig grenade” incident. Spanish conservatives are battling Spanish socialists in a fight that has involved guns, grenades, and the ever popular art of name calling. The relatively tame Romanians hosted a day long referendum to debate the impeachment of their already suspended president. While there were no weapons in sight, there was a full day of live media coverage broadcast from Second Life to real life Romanian television networks. By all accounts the mainstream news reporters considered the idea of debating national political issues in a virtual world to be completely reasonable. We’re also starting to see the emergence of a couple of new weapons that might prove to be more powerful than pig grenades — satire and parody. A Frenchman calling himself Christophe Hugo has quietly launched an island called Caractavitars. The island features an evolving set of tableaus designed to skewer world political figures. As advertised, Hugo wanders the island in an avatar designed to look like a caricature of French president Nicolas Sarkozy. The island has begun showing up in results for all sorts of political search phrases including the names of prominent American politicians. When I arrived on Memorial day weekend Hugo had set up a scene depicting a bald eagle upside down on a huge platter in what appeared to be a surreal picnic setting. A webber grill stood nearby waiting to grill up some all-American drumsticks. 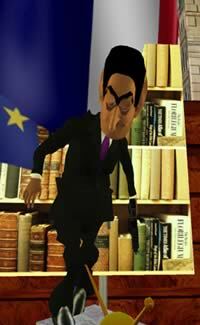 Meanwhile, Hugo, in character as Sarkozy, waived a gun around while dancing on platform built out of a a huge book, several stacks of unmarked bills, and a television set tuned to TF1 (which I gather must be the French equivalent of Fox News). I’m positive that I’m not fully grasping the nuance of Hugo’s protest and I’m sure our French readers will have a finer appreciate for the details. I approached Hugo to ask about his bizarre display. He ignored me for a while, then eventually detonated an explosive device that sent me hurtling through space and into the ocean (I’ve spent a lot of time under water these past few weeks). My avatar is in-world to display caricavatars. This is a full-time job that rarely gives him the time to chat. Enjoy your visit though. A full-time job?! I am constantly surprised by the number of people I encounter who make their living in Second Life, but this is too much. I can only blame the weak US dollar and the excessive holiday time that most Europeans are given. If they were working 60 hour weeks like most American’s they obviously wouldn’t be wasting time in Second Life mocking their newly elected president! Hugo is developing an American Caricavatars that will launch on the Fourth of July. I can only imagine what he has in store for that project. I teleported in to take a look around and found myself on the southern side of the Mexican-US border. It’s open for now, but it’s only a matter of time before the minutemen move in. Better take your Linden passport just in case. Meanwhile the US campaigns are moving forward in much the same manner as they have all year, without a hint of satire but with plenty of intrigue surrounding campaign headquarters. That new Mike Gravel campaign HQ I wrote about two weeks ago? It may have been the first officially authorized campaign HQ in Second Life, but it’s now closed. The Gravel people have moved to a new location that’s bigger and better than ever. It’s all part of the nomadic lifestyle in Second Life. Just days after the grand opening of the original Gravel HQ Second Life political blogger LailaLei Mathilde raised a number of concerns about possible FECA violations related to inappropriate corporate branding. It didn’t take long before someone else pointed out that the building’s creator, Cezary Fish, is a Polish national and that his involvement might violated the FECA laws governing the activities of foreign nationals. I discussed these issues with Gravel’s Second Life group leader Astrophysicist McCallister shortly after the closing the first campaign HQ. 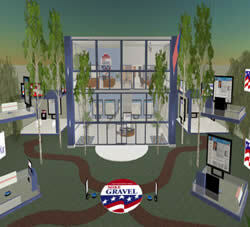 Astro asserted that that the move had been in the works prior to the Second Choices blog post about FECA issues, and that the Gravel’s virtual campaign is taking FECA matters very seriously. The Gravel Campaign is going to fully grasp this opportunity to discuss campaigning inworld, in regards to FECA, and other stated campaign laws. We’re breaking new ground, and we’re proud of it, but we do have to analyze every action from an RL point of view. Hopefully, we set the standard for campaigning in world. It’s good so hear that the campaign is taking a proactive approach to FECA compliance. Lord knows what might happen if Mike Gravel were to be elected president amidst speculation that he was secretly in the pocket of the Polish Virtual Builders Association. 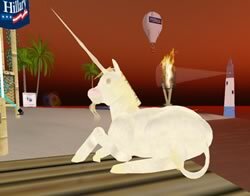 The fact that FECA issues would be raised almost immediately after the first official authorization of a Second Life campaign points to the challenges of campaigning in a virtual world with such a diverse population. Given the current state of the world everyone on the planet has a vested interest in the outcome of the 2008 presidential election. You can bet there are plenty of non-US residents in Second Life ready to jump in and do whatever they can to help their candidate of choice. While the Mike Gravel campaign is dealing with these issues today, it’s only a matter of time before the other campaigns will have to face the same scrutiny. My sense is that the Gravel campaign is taking the heat simply for being first. Regardless, the change seems to have worked out well for Gravel. On my first visit to the new headquarters I had the feeling I’d landed in a theme park called Mike Gravel World. While the original HQ was nice, the new Pup Witherspoon designed facility is much more elaborate and devotes even more space to key issues such as Gravel’s NI4D proposal. The new build is not without its quirks, however. Floating 700 meters in space and boxed-in by transparent walls, the headquarters look something like a giant political terrarium. Astro tells me the walls will keep avatars from falling off the edge. It’s nice to know the Gravel campaign takes avatar safety seriously. I get the feeling some of the other campaigns aren’t so concerned. I’ve heard more than a few rumors of a supporters being impaled on the unicorn greeting visitors at the entry of the Clinton campaign HQ. I plan on flying my Zero out to Clinton Island to investigate. With any luck I’ll have the full story in a couple of weeks. If you don’t hear from me by then, just assume I’ve crashed and I’m lost at sea. I will leave it to your responsibility to call caricatures “a waste of time”. I am sure most jihadists in the world would agree with your judgment. As for the Europeans having too much “free time” (assuming being a caricaturist cannot considered a job): FYI I live in North America… Kepp up the good work with your very accurate reports! LOL, I already regret the time when we had REAL journalists reporting on the news, not just bloggers with… too much free time. You sir have no sense of humor. Frankly, it surprises me. …or rather we don’t have the same definition of “humor”, and given your profile that would not surprise me. PS: feel free to have the last word, after all that’s the main reasn why you have a blog, right? I’m not sure which is sadder — your weak grasp of irony or the fact that you just don’t know who your friends are. You’re right about one thing. Bloggers always get the last word.